Pharma Marketing Blog: Some PhRMA Board Member Opioid-Producing Companies are NOT Signatories to Its DTC Advertising Principles & Code on Interactions with Healthcare Professionals. Why Not? Some PhRMA Board Member Opioid-Producing Companies are NOT Signatories to Its DTC Advertising Principles & Code on Interactions with Healthcare Professionals. Why Not? In December 2008, the PhRMA Board of Directors unanimously adopted measures to enhance the PhRMA Guiding Principles on Direct to Consumer Advertisements about PrescriptionMedicines. The revised Principles took effect March 2, 2009. Despite the thundering unanimity of the PhRMA Board, several current board members are NOT signatories to the principles. Specifically, Allergan, Alexion, Alkermes, Teva, and UCB are not signatories even though the CEOs of these companies are current PhRMA board members! Alkermes also markets Vivitrol - an expensive drug approved by the FDA for treatment of opioid addiction (click "Read more >>" for background). 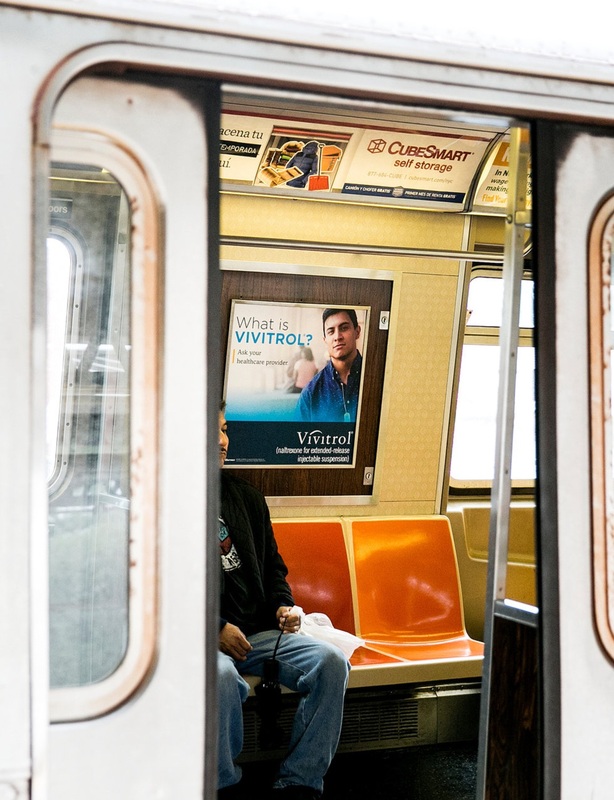 The photo above shows a "reminder ad" for this drug on a NYC subway train. Technically, this ad does not violate DTC Principle 13, which prohibits such ads that do not disclose the drug's indication or side effects. That's because Principle 13 ONLY applies to TV ads! Meanwhile, Alkermes specifically bypasses physicians and focuses on "a deft lobbying strategy that has targeted lawmakers and law enforcement officials." Alkermes - Maker of Powerful Opioid Zohydro - Lobbies Hard for Its Expensive Treatment for Addiction!